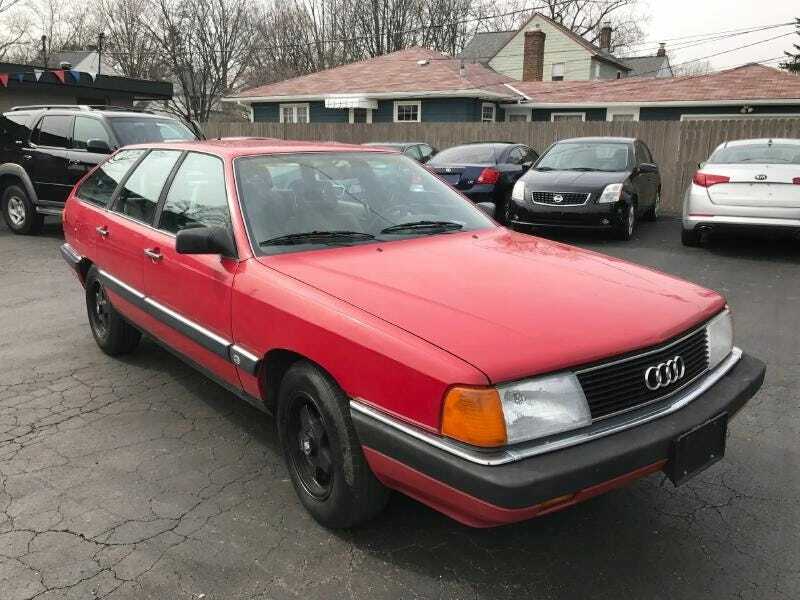 Today’s Nice Price or Crack Pipe Audi 5000 comes from the nadir of the marque’s existence in the U.S., after it was slandered by 60 Minutes for supposedly suffering from unintended acceleration. Let’s see if anyone should intentionally pay this Avant’s price nonetheless. Okay, I admit it, none of you deserved yesterday’s 2001 BMW 325it M3 wannabe, but, like a two-headed goat or Trump’s hair, it was a horror you all just had to see. None of you—well, okay, there were a couple of you—felt it worth its substantial asking, and that slammed Bimmer also dropped in a massive 98-percent Crack Pipe loss. So, on Tuesday we had a jacked-up German, and yesterday we had one that was down with the clown, and that of course means that today we go with one that’s right in the middle, right? What do you say there, Goldilocks? This 1988 Audi 5000S Avant is pretty interesting on a couple of fronts. First off, it comes from the era right after a devastating story appeared on the CBS news program 60 Minutes in which Audi was portrayed as an evil maker of cars that would randomly leap forward under their own volition. The show claimed that this “unintended acceleration” was rampant and defied even the laws of physics as owners claimed their cars continued to gain speed even with the brakes fully applied. Not mentioned on the show, was that they had secretly modified the Audi they used to “prove” the phantom behavior. In the end, Audi’s sales dropped precipitously, to the point in the early ‘90s when VAG seriously considered packing Audi up and leaving the U.S. market. Thankfully they didn’t, but those dark years mean there aren’t a ton of late ‘80s Audis around from which to choose any more. Well, there’s that and the fact that they’re just plain old cars and most of them have gone to the crusher. This one’s still around, and it’s described as being rust-free and, except for a ding on the off-side fender, looks like it’s in pretty nice shape as well. One other reason this Audi is interesting is for what it lacks. It’s FWD only, which means its 130-bhp, 2.3-litre inline five doesn’t have to cart around an extra 300 or so pounds. It’s also an Avant, which I think we can all agree is a pretty sweet body style, what with its airy greenhouse and Citroën-esque shape. This one is in a jaunty Tornado Red which is a rare color for so large a German car, I think. Black-painted five spokes underpin and look tough. There’s 216,000 miles on the clock and a peek inside shows that the car has held up well over their course. You’ll note a bunch of GM parts in here, including the climate control unit and the switches for the power seats. Those seats are cloth, and have survived with just some minor wear, as has the dash, carpet and doorcards. On the downside, this Audi is an automatic, as such things oftentimes were and still are. Not only that but it only sports three-gears for going forward, and two fewer than that for going in reverse. Perhaps making up for that there are six adjustable air vents in the dashboard. I’ve driven one of these 5000s pretty extensively, albeit one with the 100-horse 2.2 and a five speed, but regardless I can aver to the cars being comfortable cruisers all the live long day. This one being an Avant is just cream on the strudel. All that comes wrapped in a bow and costs $1,200 from its used car dealer lot. That’s chicken feed to be sure, but is it also Avant fodder? Would you pay $1,200 for this seemingly tidy but long in the tooth 5000? Or, is that too much for a dark-days Audi? Car Gurus out of Columbus OH, or go here if the ad disappears. H/T to Bart Deal for the hookup! You Want More? We Got More. For $32,500, Could This 2001 M-Modded 325it Create Some Pandemonium?